President Hugo Chavez has ordered an urgent investigation to find the cause of a huge explosion at Venezuela’s biggest oil refinery. The death toll after the blast at the Amuay plant in Falcon state, in the north-west of the country, has now risen to 39, with more than 80 others injured. Hugo Chavez declared three days of national mourning. Earlier, Energy Minister Rafael Ramirez said a gas leak had caused the blast. Hugo Chavez said the tragedy had touched all families in the country. “I want to send out to the families of those who died, civilians and military, all our pain, mine, that of all my family, everyone in the national government and the people of Venezuela,” he said. Venezuelan Vice-President Elias Jaua said 18 of the victims were members of the National Guard stationed at the plant. Another 15 were civilians, and six bodies remain unidentified, he said. Venezuelan authorities say the worst is over and the fire is now under control. Amuay, on the Paraguana peninsula, is part of the Paraguana Refinery Complex, which also includes the Cardon refinery. It is one of the biggest refinery complexes in the world with an overall capacity of 955,000 barrels per day, Reuters news agency notes. The accident has halted operations at the refinery, but Rafael Ramirez said he expected production to be resumed by Monday. Rafael Ramirez said that Venezuela had enough fuel supplies to guarantee continued exports and domestic supply. The blast occurred at 01:11 on Saturday. It unleashed a huge fire that destroyed two fuel tanks and stopped production at the plant. 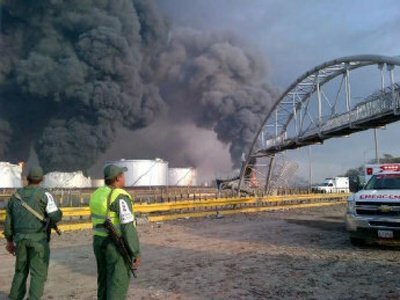 “The gas cloud exploded, igniting at least two storage tanks and other facilities at the refinery,” the energy minister told state TV. “It was a significant explosion, there is appreciable damage to infrastructure and to houses opposite the refinery,” said Rafael Ramirez. Falcon State Governor Stella Lugo said nearby houses had been damaged by the blast. Venezuela has the world’s biggest certified oil reserves. But critics blame under investment by the state-controlled oil company for a decline in production and safety standards. Refineries have suffered from a long list of problems including power failures and accidents.